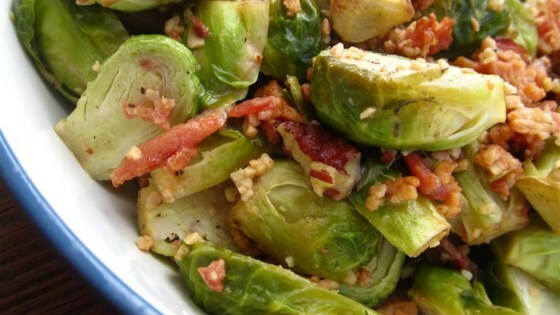 "Brussels sprouts are simply roasted with pecans and a light olive oil and garlic glaze." Preheat oven to 400 degrees F (200 degrees C). Place the Brussels sprouts, pecans, olive oil, and garlic onto a large rimmed baking sheet, and toss the ingredients together until well combined and coated with oil. Spread out into a single layer, and turn the Brussels sprouts to face cut sides down. Roast in the preheated oven until golden brown and tender, 20 to 25 minutes. I made these tonight and substituted slivered almonds. Loved this recipe. I haven't had brussels sprouts in 40 years and was pleasantly surprised that I like them! Although I overcooked it, Ann said it was excellent. Easy and very tasty. Mom also like it.